(Host) It’s been a tough winter for snow sports – the type of season that can be devastating for a small family run business like Cochran’s Ski Area in Richmond. But Cochran skiers have come up with a way to support their favorite ski hill. (Noyes) Despite temperatures in the mid-80s, skiers and riders headed for the one patch of snow left at Cochran’s Ski Area. They came to participate in a rope-a-thon. The idea was to collectively ski and ride 5 million vertical feet using the ski area’s rope tow, and raise $20,000. Cochran’s had such a tough season, the money will help pay the bills. Unfortunately, there wasn’t even enough snow left to operate the tow. 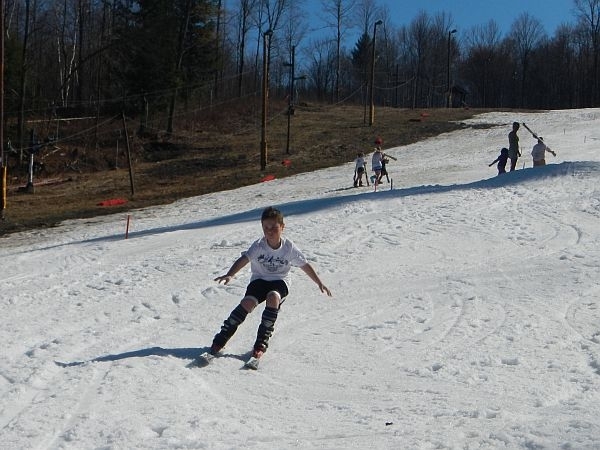 But that didn’t stop families of skiers from hiking up the hill and taking a few runs in their shorts and tee-shirts. (Wilkinson-Ray) "Unfortunately, this past week of very warm weather means we don’t even have enough snow to run the rope tow. So instead we’re out here and we’re hiking. We have a little course set and we’re grilling and listening to some music. So we’re still fundraising money and having a blast." (Noyes) Olympic Gold Medalist Barbara Ann Cochran and her siblings run the ski area that their parents started. She says the area is actually a nonprofit corporation. (Cochran) "We are a nonprofit. We were the first nonprofit ski area in the country, I believe. Mom said that they were always nonprofit, they just never had the stamp of approval for being a nonprofit. Our goal is really to provide affordable skiing and boarding for families of any size. And that’s what the mission was when my parents really started this. It’s been what we’ve been trying to do for the last, over 50 years now." (Noyes) If the snow holds out until Sunday, Cochran’s will hold its last event of the season: the annual "Thank God for Snowmaking Slalom." For VPR News, I’m Amy Noyes.